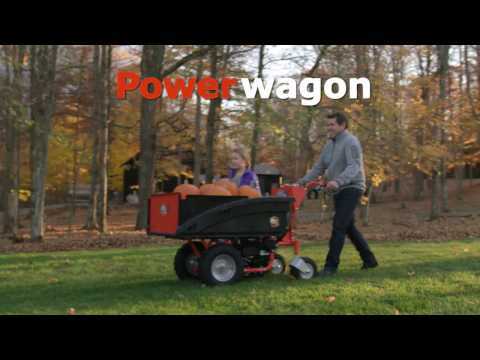 With 40% greater capacity than our entry level model, the PRO Powerwagon can haul up to 700 lbs with ease. Features a powerful electric-starting engine and a modular cargo bed with removeable end panel. Accepts the optional Flatbed Kit accessory. Powerful. Versatile. Easy to Use! Take it far afield–the DR Powerwagon is a powered, all-terrain hauler. Swiveling rear wheels let your turn on a dime so maneuvering is EASY. The more weight you carry, the better traction you get. The PRO model hauls up to 40% more than our entry model (up to 700 lbs). The PRO also adds more power (7.25 fpt), electric-starting, and a modular cargo bed with a lift out end panel to allow for dumping or carrying longer loads, Add the optional Flatbed Kit for the ability to carry extra long or stackable loads. The locking cargo bed handle is designed so that you can twist, to unlock the bed, and lift, to tilt the cargo bed into dumping dumping position, with one just one hand (depending on the weight of the load). The steep 60° dump angle empties the bed thoroughly, minimizing the need for raking out materials. With 7.75 foot pounds of torque (163 cc) this engine will power loads of up to 700 lbs with ease. With turn-key electric starting, it features a debris management system that protects the engine from whatever you kick up while you’re cutting. Awesome product, does everything I hoped it would. One suggestion--some type of plastic shroud over the motor/Drive unit. Just something to shed the water & debris while using or cleaning the unit. Other than that---it is freaking awesome. I'm getting older and hauling loads of firewood, mulch, etc isN a wheelbarrow is getting difficult. The dr power wagon makes it a lot easier. Assembly was fairly easy although the instructions could have been clearer. I had it delivered to the top of my driveway but didn't.t realize that due to the gearing and transaxle it will not roll freely even in neutral. The engine needs to be running to move it. So... I had to fully assemble it and add gas and oil before I could fire it up and move it down the driveway to my garage. Kind of a pain but not that big a deal. Just be prepared if you order one. Since then it starts every time and seems to work fine. Probably the best bang for the buck you will find in power wheelbarrows, etc. Some flaws, but still a good buy. I have had an older model for years, just replaced it with this one. Two rear wheels makes it feel more stable, but harder to turn. Traction when empty is not very good. Older model had weights included, this model requires additional purchase of wheel weights to increase traction. They should be included at this price level. When dumping gravel, some rocks may get caught in the drive pulley, stopping the wheel drive. Composite bed seems sturdy enough, just have to make sure the tailgate is properly engaged in the sides. I have had no trouble with the dump mechanism. All in all a little pricey, but still a good workhorse. The dump mechanism is poorly designed. It barely holds the bed in place and will spontaneously dump on you causing the load to hit the flimsy lift gate and breaking the cheap plastic sides holding it all in place. If you have any kind of hill or loose dirt, you might as well use a wheelbarrow because you will be manhandling this unit as if that was what you were using. I only purchased this product because the brush cutter I have is a tremendous piece of equipment and well worth the money - this thing, not so much. I love my Powerwagon and it does everything they advertised it to do. One minor improvement they could do is to make a stronger, more sturdy back gate latch as mine broke after a few loads. It will work real well for getting wood in. Also for doing clean up in the yard. I find this extremely helpful and am able to enjoy outside farmwork even as I grow older. Q.What degree grade will the Pro climb fully loaded? A.Thank you for contacting us regarding the DR PowerWagon. It should not be operated on slopes greater than 15 degrees or any excessively steep slopes. Please feel free to contact us if you have any other questions. Q.Will it take both hands to unload this unit? A.With the integrated latch and handle design, it's easier than ever to unload the Power Wagon! You will only need on hand to release the latch and lift. Please feel free to contact us if you have any other questions. Q.What happens if I hit a rock with this unit? Q.How fast can this unit go?